The T4 free test checks the free T4 blood level. What is a free T4 test? A free T4 test measures the free T4 blood level. Why is a free T4 test important? The free T4 blood test measures how much free T4 is being produced by the thyroid gland. This T4 Free Test is a blood test. The T4 free test, also known as a free T4 blood test and T4 free lab test, measures the free T4 blood level. T4, or thyroxine, is a hormone produced by the thyroid gland. T4 free represents the free, or bioavailable, portion of thyroxine in the blood. To circulate through the blood, most T4 is transported by a special carrier protein in the plasma while a small fraction of it circulates unbound, or free of the protein transported. Free T4 is important when it gets to the target tissues as it is available to be absorbed by the cells in contrast to bound T4 which must first detach from the carrier protein. And so, the term bioavailable, or free, represents T4 that is more readily available for immediate use by the body. Free T4 testing is often done in conjunction with the T4 total test to get a more complete picture of how much thyroxine the thyroid gland is producing. Because the free T4 blood test provides information that can help determine when one is hypothyroid or hyperthyroid, it is included in the hypothyroidism test panel and the hyperthyroidism test panel respectively. To get a T4 free test near you, order online and get tested at the Quest Diagnostics you selected. Once the T4 free lab report is ready, it will be available for download. 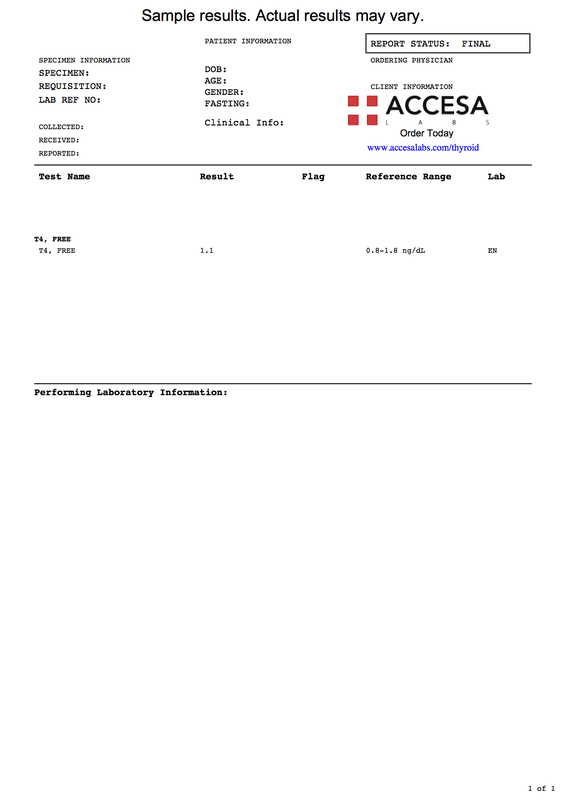 As can be seen on the sample T4 free lab results, the T4 free blood level is reported as a numerical value and can be compared against the reference range provided by the lab. T4 free blood testing is also performed as part of more detailed thyroid testing panels, including the Graves' disease test panel and the Hashimoto's disease test panel. The T4 free lab test is also a component of our comprehensive thyroid test panel. T4 Free Test at Guaranteed Prices.